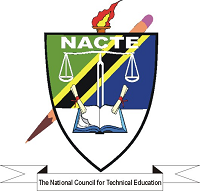 The National Council for Technical Education (NACTE) is a statutory body established under the National Council for Technical Education Act, Cap. 129, to oversee and coordinate the provision of technical education and training in Tanzania. Under the establishing Act, in order to attain and maintain the status of a training provider, all institutions are required to be registered, accredited and have their curricula approved by the Council. Institutions are not allowed to admit students and start offering any programme without the approval of the Council. The admission and selection of students for various Certificate and Diploma Programmes offered by Technical Institutions, Universities and their constituent Colleges shall be conducted by Technical Institutions and Universities themselves. All applications for admissions should be submitted to respective technical Institutions or Universities except for public institutions offering health & allied sciences; and teacher education courses. Admission into public institutions offering health & allied sciences, and teacher education courses shall be coordinated by the Ministry of Health, Community Development, Gender, Elderly & Children; and Ministry of Education, Science & Technology respectively in collaboration with NACTE. In that respect, all applications for admission into Certificate and Diploma programmes for health & allied sciences; and teacher education programmes delivered by public health & allied sciences schools, and public Teacher Training Colleges should be made online via NACTE website (www.nacte.go.tz) or through the respective schools and colleges that will submit received applications for admission through their respective Institutional Panel.